On Aug. 24, United States President Donald Trump announced a freeze in denuclearization talks with North Korea over what he felt was a lack of progress on the issue and the People’s Republic of China’s (PRC) inadequate cooperation with sanctions. Since then, Democratic People’s Republic of Korea (DPRK) leader Kim Jong Un has begun signaling that he is committed to complete denuclearization. A new letter by Kim to Trump requesting another meeting has the White House preparing to arrange a second summit. Meanwhile, the PRC has taken steps to strengthen PRC-DPRK ties around the period of the 70th-anniversary of the DPRK’s founding. We believe that Kim’s latest gestures are a positive omen of further advancement in the denuclearization process. Also, the PRC could become increasingly isolated as the U.S. and the DPRK draw closer. South Korean national security officials meet with Kim Jong Un in Pyongyang. A day later, Chung Eui-yong, South Korea’s national security advisor, told reporters that Kim’s faith in President Trump was “unchanged,” and he wanted to completely denuclearize North Korea and end hostile relations between the DPRK and the U.S. by the end of Trump’s first term. Chung also said that Kim and South Korean leader Moon Jae-in will meet in Pyongyang from Sept. 18 to Sept. 20 to discuss “practical measures” towards denuclearization. Wang Yang, a Politburo Standing Committee member and the Chinese People’s Political Consultative Conference chairman, attended a reception at the DPRK embassy in Beijing to mark 70 years of the DRPK’s founding on Sept. 6. 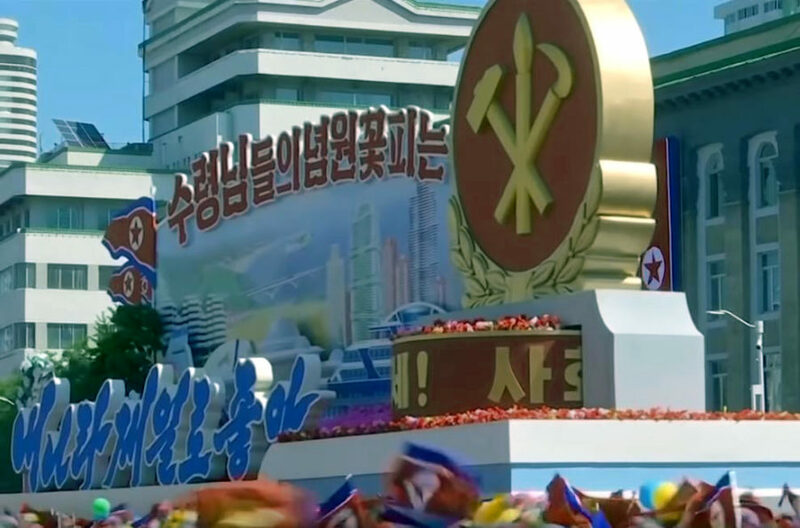 The DRPK’s 70th-anniversary parade did not feature intercontinental ballistic missiles, unlikely in recent parades. Instead, floats promoting economic development and modernity were on show. There were also floats bearing North Koreans waving the flags of a unified Korea. Li Zhanshu, the third-ranking Politburo Standing Committee member and National People’s Congress chairman, attended the DPRK parade as Xi Jinping’s special envoy. He appeared on the podium with Kim Jong Un, who held his hand aloft while waving to parade participants. President Trump tweeted that the lack of ICBMs at the DPRK parade is a “big and very positive statement from North Korea,” and thanked Kim. “We will both prove everyone wrong! There is nothing like good dialogue from two people that like each other! Much better than before I took office,” he added. Li Zhanshu passes Kim Jong Un a personal letter from Xi Jinping. The letter hails Kim’s efforts to develop the economy per his new “strategic line,” and reaffirms the PRC’s commitment to strengthening relations with the DPRK, according to state mouthpiece Xinhua. In his meeting with Kim, Li said that the PRC wants to play a “constructive role” in resolving issues on the Korean Peninsula politically with other nations. The White House said that Kim Jong Un had sent a letter requesting for another meeting with President Trump, and that it is working on arranging the second meeting. White House press secretary Sarah Sanders said that the letter was “very warm” and “very positive,” and described it as “further evidence of progress” in the relationship between Kim and Trump. Sanders also said that the White House wouldn’t release the letter unless North Korea agrees to it. 1. When news broke in March that Kim Jong Un was in Beijing, we analyzed that he was looking to exchange his nuclear weapons for a lifting of sanctions and a way to preserve his rule over North Korea. Subsequent developments have convinced us that Kim genuinely wants to denuclearize and end hostilities on the Korean Peninsula within Trump’s first term (see here, here, and here). Kim is likely acutely aware that no other U.S. president would be willing to offer North Korea a chance for true rapprochement with America and the world, as well as the opportunity to reform North Korea, end the regime’s existential crisis, and transform the situation on the Korean Peninsula. Hence, it is unsurprising (to us at least) that Kim would be giving a timeline for denuclearization and reaching out to Trump for another meeting despite being recently “spurned” by the latter. After the Singapore summit, we have seen the DPRK appear to “backslide” on denuclearization by insisting on a so-called “step-by-step” approach, foot-dragging on tearing down a missile engine site and handing over the remains of American soldiers who fought in the Korean War, and threatening that the process “may fall apart” (according to some accounts). Trump, however, has signaled that America would not be swayed by DPRK shenanigans by canceling Secretary of State Mike Pompeo’s scheduled trip to North Korea in August and declaring that the U.S. would only resume denuclearization and peace talks after resolving a trade dispute with the PRC. Trump then proceeded to announce plans to escalate the Sino-U.S. trade war. In light of Trump’s actions, the DPRK must have surmised that the old playbook would not work with the Trump administration, and that Kim Jong Un would be better served by not further testing Trump’s resolve (at least not in the near-term) and shifting back to genuine rapprochement. During a Congressional hearing in July, Secretary Pompeo noted that the administration is engaging in “complex negotiation with a difficult adversary,” and that activities undertaken by the administration are “not going to be apparent to the world at the moment it is undertaken.” We expect to see continued “setbacks” in U.S.-DPRK denuclearization and peace negotiations, but steady, positive progress in the overall process. 2. The PRC might be talking about the need to foster closer relations with the DPRK, but PRC-DPRK enmity runs deep historically, and particularly so during Xi’s first term in office (see our earlier analysis). Apart from ideological reasons, Kim Jong Un has few incentives to stay in the DPRK-PRC alliance. Even the economic benefits that the PRC can promise to provide may not be enough to convince Kim to keep North Korea as China’s “buffer state” indefinitely. And with the escalation of the Sino-U.S. trade war and the worsening of China’s economy, the PRC might not be able to deliver much “economic benefits” to the DPRK. Instead, Kim might be calculating that it is in North Korea’s greater interests to pivot to America. Kim and the DPRK would likely have noticed the watershed in America’s China policy and the Trump administration’s efforts to abandon the PRC-hijacked world order and reshape the post-WWII global system (see here, here, and here). As the PRC becomes increasingly isolated internationally, it would make less sense for the DPRK to cling to the old system that it is trying to escape from. Moreover, as Kim would have observed or learned, the U.S. is more likely to keep its word when a deal is reached as opposed to the PRC. By completely denuclearizing and ending hostilities with America on American terms and subscribing to the Trump administration’s “free and open Indo Pacific” strategy, the DPRK stands to modernize and grow its economy with the aid of the U.S., South Korea, Japan, other regional democracies—an opportunity that is incomparable with just more trade with the PRC. If there is indeed a second Trump-Kim summit, the U.S. and the DPRK could sign a declaration to end the Korean War, with a formal treaty to be signed at a later date. With this declaration, Kim Jong Un should have sufficient political ammunition to convince the DPRK elites and the military that North Korea no longer needs to develop nuclear weapons to fight the “American imperialists,” and better sell denuclearization to the North Korean people. Kim can then proceed to take concrete steps toward irreversible and complete denuclearization (we outlined an example of how this might happen here). Once the Trump administration is satisfied with the progress, a formal peace treaty can be signed to consolidate the gains and secure enough goodwill on all sides to push the denuclearization process towards the finishing line. We expect the Trump administration and the DPRK to proceed with the process mentioned above in a relatively low-key manner due to its politically sensitive nature. 1. Ideology and factional struggles determine the interests of communist regimes like the DPRK and the PRC. Understanding the logic behind the interests is key to deciphering motive and actions. 2. Authoritarian regimes have their unique methods for conveying true intent. Sometimes, regime propaganda doesn’t always align with intent, at least on the surface. Misreading intent and signals could result in missed opportunities or missteps. 3. Having a deep understanding of communist regimes is vital to devising effective policy and countermeasures.